Did You Fail a Nursing Class? 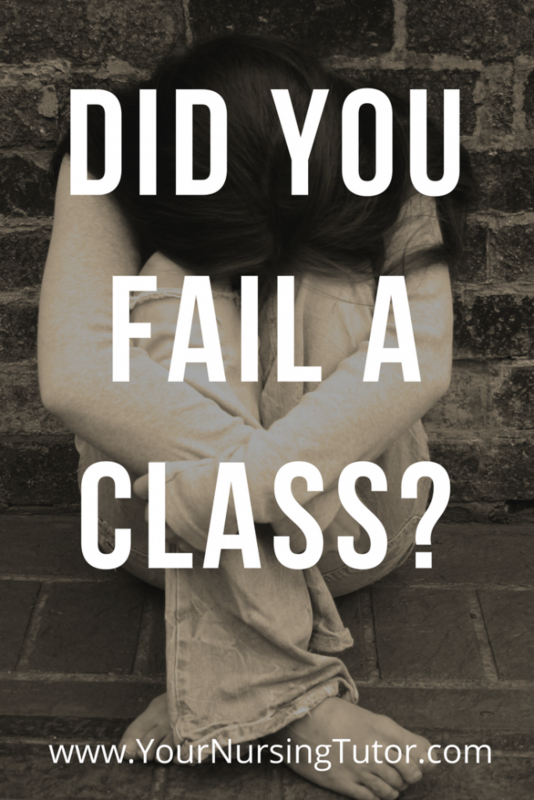 Were you one of the many nursing students who failed a nursing class last semester? It’s more than just the bad grade. Failing a class hits you emotionally, financially AND academically. And if you intend to try again and continue in nursing school, then it’s going to be essential for you to address all three of these areas. If you’re currently at a loss for what to do next, let me tell you one thing NOT to do…and 3 things you should do instead to improve your chances next time around. Hope is supposed to be a good thing…and it is. But hope without a plan is more likely to leave you with the same disappointing failure next semester. If all you do is hope you’ll do better next time, then you’re going to have exponentially higher general anxiety levels, higher test anxiety, more stress, and less self-care. That’s a recipe for disaster. If you want to get different results next time, you need to do something differently. “Hope”, by itself, is not a plan. But here is how you can combine hope with a plan that will actually work. 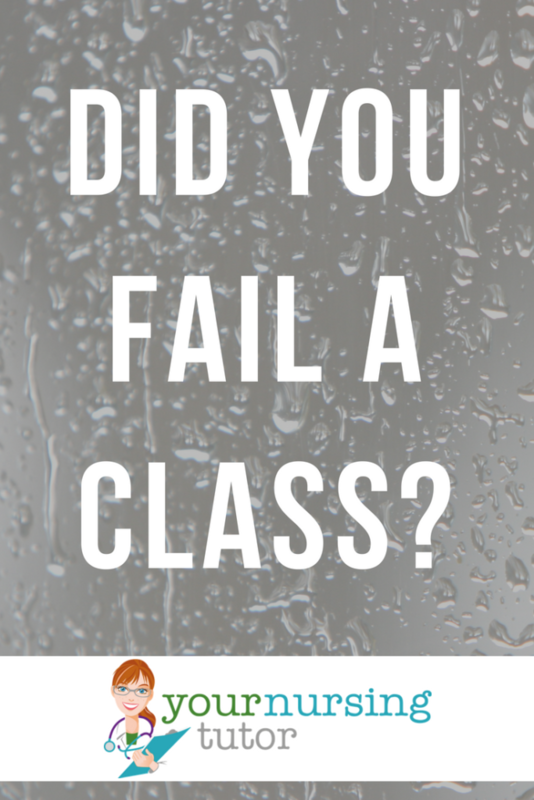 What does it mean when you fail a class? Well, it means that you are human…and you failed a class. It doesn’t mean the world is coming to an end. It doesn’t mean your friends will hate you, and it doesn’t mean that your family will disown you. And it certainly doesn’t mean that you’ll never be a nurse. When we’re disappointed and uncertain about the future, we have the tendency to assume the worst. And that often leaves us pessimistic and anxious. Not a good combination!! Give yourself a bit of grace. Failing a class does not define who you are as a person OR as a future nurse. Instead, use this experience to mold you into a more compassionate, caring nurse. Spend time focusing on other areas of your life that make you feel good about yourself and get you refocused on the positive things. It will also be imperative for you to come up with a strategy to manage your anxiety, especially any test anxiety that will be popping up next semester. Luckily for you, I have created and tested a super simple method for conquering test anxiety that WORKS! I occasionally hear from students who think that tutoring costs too much, or they don’t want to spend money on the PASS Program, or they don’t want to purchase a review book or class. 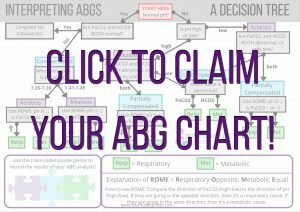 But if the information and guidance gained from these resources will help you pass your nursing class next time around, wouldn’t it be worth the money? Many nursing schools have a policy of letting you fail one nursing class. But if you fail a second time? You’re generally asked to leave the nursing program. And it can be really tough to get accepted into another nursing school after that. It’s also going to be a LOT more expensive to start over. Find a resource that matches your need and your budget. If you were really close to passing, then a few little tweaks might be all you need. But if you have a lot more ground to make up in your knowledge base, then you probably need to find a more individualized solution. Taking advantage of your professor’s office hours is free! Choose one or several of these options, depending on your situation. They could be a great investment in your future nursing career. Wishing and hoping to pass your class is not going to get you to graduation. 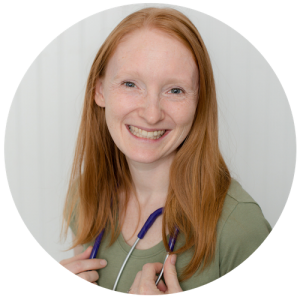 If you approach your nursing class the same way, making the same mistakes, and worrying about the same problems…then you can expect to get the same result. If you think you failed because of a “bad” professor, or unfair test questions…it doesn’t matter. Those are things you can’t control in your nursing program. All you can control is yourself, so you need to focus on doing things that will make you more likely to succeed next time around. Join (or create) a good study group, review your A&P, improve your test-taking strategy, or change the way you study. These are all good examples of how to start setting yourself up for success next time. What are you going to try differently before retaking your next nursing class? I am taking my prerequisites right now for RN, I am currently getting a B- for my biology 160 (general Biology) and a B for my psychology. The college that I am going to is apparently very comptetitive in Nursing. I am so frustrated right now and do not know what to do. I am planning to repeat the Biology class. What should I do? Also, I’m unsure how your program is, BUT in mine we have 6 Rights to check 3 times in the process of administering medications (1 check as we are pulling the meds another before we go to the pt and the last is at bedside after identifying the pt and allergies). These are not to be of inconvenience to you as a student but to prevent you as a future nurse from harming or potentially KILLING your patient. Keep this in mind. From the sound of it your mistakes show that you think you know what you are doing and feel as if you do not need the clinical instructors there. This is a huge mistake. If you show that you are not willing to learn or be safe or own your mistakes or if you show that you feel as if you know it all and don’t ask questions throughout the day, then there is no way any instructor will allow you to continue. The reason why is because this makes a careless nurse who will make mistakes that are fatal. So, from learning these things about yourself you should take it in, understand you can change for the better. As long as you are hungry for knowledge and to correct mistakes you will be a better student and eventually have that dream job of being there for those who need someone as an advocate and caretaker. Also, why do you want to be a nurse. Be honest. If it is for the money find another career. I got through the quite similar situation and totally understood how you feel. You must have depressed and frustrated so much. I hope you can get over it as soon as possible. To be fair, I am an international student that is one of my excuses. In this case, it happens and is mostly accepted in my country but here is not. I admitted it was caused from my regardless behaviour but my different background as well. Just take care yourself, dear. This website sounds incredibly useful. I’m yet to start my AD Nursing program this Fall. I’m really scared and don’t know how to face my first nursing course. I’m interested in learning how to interpret the NCLEX questions. Could you lead me in the right direction. What I have seen online in the free membership section has intrigued me to want more. Do you have a specific course that deals with interpretation of the question (what is it asking). Could you lead me in the right direction. Also, if you have a newsletter, I would like to receive it. Hi. I failed the 3rd semester of RN school last month. It took me 7 years, including waiting 2 years on waitlist, to get into nursing school. Unfortunately, I can not repeat the semester, I have to start all over or become a LVN and work one year and reapply into the program. I am very depressed about this situation. The programs is California are very difficult to get into to and it’s such a long process. I don’t know what to do. It’s not hopeless, you mentioned a couple viable options in your message. It’s not the end of the world to start over, and becoming an LVN then completing a bridge program to RN is also a great option. If you have the flexibility, looking for programs outside of California can also be an option. I know it can feel devastating to have this happen, but there are lots of people out there who have failed at some point, then went on to become great nurses. Good luck! Could you please send me information regarding this program.